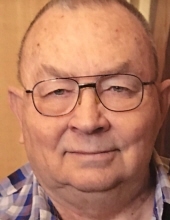 Funeral services for Ralph Raymond Nordyke, 82, Clearfield, UT, are 11:00am, Saturday, April 20, 2019, with a viewing at 9:30am, at the Church of Jesus Christ of Latter-day Saints, 1103 24th Ave. NW, Aberdeen, SD. Burial at Riverside Memorial Cemetery, Aberdeen. Ralph died Friday, April 12, at home in Clearfiled, UT. Visitation is 6:00-8:00pm, Friday, at Spitzer-Miller Funeral Home, 1111 South Main Street, Aberdeen. To send flowers or a remembrance gift to the family of Ralph Raymond Nordyke, please visit our Tribute Store. "Email Address" would like to share the life celebration of Ralph Raymond Nordyke. Click on the "link" to go to share a favorite memory or leave a condolence message for the family.